Isola Platon DE25, a drainage and water storage layer designed for use in green roof construction, is being used to form part of the Sedum Roof construction at an ‘EcoExcellent’ rated development in Wiltshire. A total of eight Sedum Roofs are included in the development which will provide 256 new homes. The actual roof construction consists of a Plywood deck fixed to a traditional timber joist sub frame. The deck is initially covered with a Polythene vapour control layer, rigid Polythene insulation and a Wolfin M waterproofing membrane supplied by Advanced Environmental Roofing, which is mechanically fixed to the deck with screws and plate washers. A protective fleece is then laid on the membrane to prevent abrasion. The Isola Platon DE25 layer is then loose laid over the fleece. A geotextile filter fleece is then laid to prevent soil or fines being washed away by rainwater. With just 30mm of growing medium required, a Sedum mat was chosen as the finished roof covering. Around the perimeter and along a central pathway is a zone of 20-40mm round washed pebbles which are retained by Advanced’s unique lightweight ‘Gravel Stop’ metal profile. A man-anchor system is also installed along the central pathway for future use by maintenance crews. Isola Platon DE25 is exclusively supplied in the UK by Triton, part of a complete range of systems supplied by the company to specialist contractors involved in roofing, basement conversion and other waterproofing works. Advanced Environmental Roofing Systems is based in Derbyshire and was set up in 2006 to provide total green roof solutions throughout the UK. 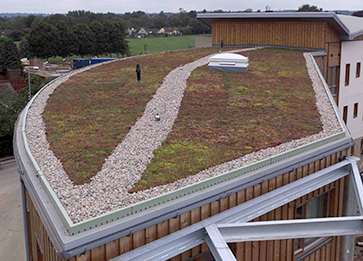 The company co-ordinated the supply of all materials for this green roof project, and its construction by specialist installers, Coleman Roofing Contractors of Swindon and Evergreen Roof Gardens of Worthing.